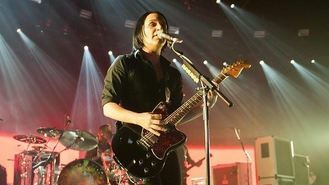 At their first UK gig of the year, at north London's Roundhouse as part of the month-long music event, a ndrogynous frontman Brian Molko kept interaction with the crowd to a minimum, aside from introducing the band and a handful of songs. Ahead of Too Many Friends, the Belgian-born singer said: "We have had to change some of the names for legal reasons, but I notice some of you are here tonight. You know who you are." The set was peppered with tracks from throughout their career, spanning nearly two decades. Opening with B3, the title track of their sixth studio album, the trio played a set which included crowd favourites Every You Every Me, The Bitter End and Special K.
Brian, bassist Stefan Olsdal and drummer Steve Forrest were joined on stage by three members of a backing band, each decked head to toe in black. After a 13-song main set, the group returned to the stage for an encore which included Running Up That Hill, their tribute to the reclusive Kate Bush, who recently ended a 35-year hiatus to perform a series of headline concerts at London's Hammersmith Apollo. Ben Howard, Mary J Blige, Kylie Minogue, Lenny Kravitz and Ed Sheeran are to perform at the iTunes festival in coming days, with their performances streamed live. The event will conclude on September 30 with tenor Placido Domingo, having already played host to artists including Elbow, Calvin Harris and Blondie during the month.